While your Yamaha Marine dealer can help you with, or even do, most of your general and preventative maintenance, corrosion mitigation is something you can only do yourself—and time is of the essence. Regardless of where you boat, corrosion attacks both the inside and the outside of your outboard—every day, all the time. Some forms you can see, some you can’t, and it can take only a short time for the damage to begin. Even those boating in freshwater have corrosion-mitigation duties to attend to. 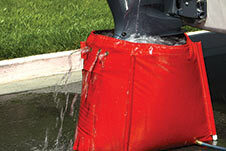 Why, even rainwater can have corrosive effects that can be damaging to your outboard. So it’s vital to be diligent in your anti-corrosion defense. Your dealer can help provide the right products to help prevent some forms of corrosion, but their regular and diligent use is strictly up to you. The following are answers to common questions about how to mitigate the presence and damage of corrosion. Where do I need to concentrate my fight against corrosion? Corrosion can happen pretty much anywhere on or in your outboard: inside, in your fuel system or in the internal cooling water passages, and on the outside, in various electrical connections and exposed metal components. But don’t worry, you have a lot of allies on your side, and we’re here to help by teaching you where to look and what to look for. What is “dry corrosion”? What causes it and what can I do about it? Dry corrosion occurs in areas not in direct contact with water—exhaust systems, for example. The outside of most exhaust system components is cooled by raw water to prevent overheating. When today’s ethanol-enhanced fuel is burned, it creates by-products known as sulfate salts. These salts are highly corrosive, especially when exposed to very hot temperatures. If the outboard’s cooling water passages are not kept clean by regular flushing (the exhaust area in this example), hot spots can form on the interior of the exhaust components, concentrating the sulfate salts’ corrosive effects. In effect, it’s corrosion from the inside out. That’s why flushing your engine with fresh, clean water for 15 minutes after each trip is a vital part of preventing even dry corrosion. It helps the cooling system run at maximum efficiency by keeping the cooling water passages clean and clear, which helps minimize the heat inside the engine, making it less susceptible to dry corrosion. What’s so important about flushing my outboard? I boat exclusively in freshwater, do I still need to? Your Yamaha outboard is raw-water cooled, meaning it uses the water it’s operating on as cooling water. All water, fresh or salt, contains contaminants that will eventually build up in the cooling passages over time. Additionally, saltwater is naturally corrosive and any remaining in those cooling water passages after use is left there to do its worst, unabated. Saltwater can also experience crystallization when exposed to heat above 170 degrees, which causes deposits to form and potentially restrict cooling water passages. For these reasons, it’s a must that you flush your engine thoroughly with fresh, clean water after every use. How do I go about flushing my outboard? Use one of these three basic methods to flush after each trip. Use the built-in flush attachment. This is a great procedure to follow, especially if you can’t remove your boat from the water, or if your outboard has dual water inlets and you don’t have the special adapter. Simply connect a garden hose to the inlet side of your non-running outboard’s built-in flush attachment, turn the spigot on full blast, and let the hose’s water pressure do the work. Let the water run for 15 minutes to ensure it fully circulates through the entire cooling system several times. If your boat’s out of the water, like on a trailer or a lift, the fresh water will also trickle down and adequately clean the water pump and the lower unit’s cooling water passages. The flush muff method. This is the most common and often-used fresh water flushing method. 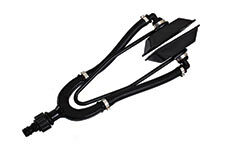 Simply connect a garden hose to clean fresh water on one end and a “flush muff” attachment, which slides around the lower unit to provide water to both sides of the raw water inlet, to the other end. Turn on the water until you see water squirting out the sides of the flush muff, then start your outboard in neutral. 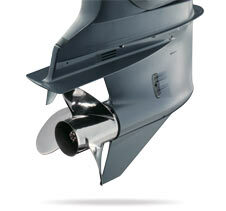 Set the outboard to no more than a fast idle (900-RPM max) and allow to run for 15 minutes in neutral. Increase hose water pressure enough to maintain a bit of squirting out from under the flush muffs at all times while the outboard is running. This helps ensure it gets fed enough cooling water. Tip: Outboards utilizing two cooling water inlets require a special adapter to use this method. Check with your outboard’s manufacturer. Tip: Increasing engine speed may cause water demand to exceed supply. If you notice the hose becoming flat while the outboard is running using this procedure, increase the water flow and/or decrease the engine RPM. Warning: For safety, we suggest you remove the propeller before you begin. Accidental engagement of the outboard into gear with the outboard running will cause an exposed propeller to spin rapidly, possibly resulting in serious injury or death. The flush bag method. This method can be used for a boat on a trailer or when moored. A flush bag, when filled with water, simulates the outboard idling in its normal state but immerses the lower unit in fresh, clean tap water. Simply place the bag around the outboard, attach the hose, and fill the bag. 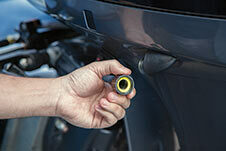 Ensure the water level reaches the height of the outboard’s water pump (about 1” above the lower unit separation seam). Start the engine, and run for 15 minutes in neutral. Leave the hose running during this entire procedure. When complete, stop the outboard, then the hose, and then drain the bag. Tip: Thoroughly dry the bag before storage. How can I fight corrosion on the outside of my outboard? It’s a good practice to set up a regular schedule and stick to it. There are quick and simple things you should do after every use if you boat in saltwater, and periodically if freshwater is your game. These include visual inspections you should do every time. 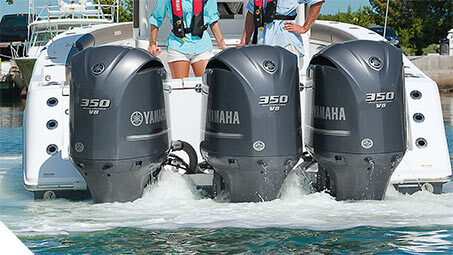 If you’re unsure about what to do and when, your authorized Yamaha Marine dealer can help.